The question if a senior or elderly person should own a pet is frequently asked, and the answer is not cut and dry. Many personal decisions have to be made and there is no right or wrong answer. It is entirely up to the individual, but this does not mean that there is no data or research out there to help one decide. Roughly 62% of Americans own at least own one pet, and many claim positive benefits, but how does this relate to the elderly? Below you will find some research into the subject, as well as some of the important questions that one has to think about prior to owning a pet. Some of the physical benefits of owning a pet is there is a link to lower blood pressure, cholesterol, and the heart’s pulse rate. Another study found that elderly pet owners also visit the doctor 21% less than non-pet owners. Pets have been linked with a decrease in depression and loneliness, as well. Pets also benefit their owners by making it easier to break the ice and create new friendships, as well as enhance social opportunities in the community. 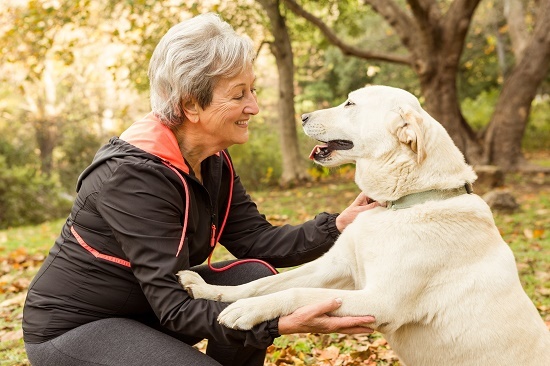 Pets help to keep seniors active, from walking the dog or playing with a cat, to basic activities such as grooming, feeding and supplying water, and cleaning up after their unpleasant business. In addition to the physical benefits, there is anecdotal evidence that pets also help the emotional and mental well-being of their owners, as well. Some of these benefits include that seniors generally take better care of themselves when they own a pet. This includes maintaining a regular schedule, and everything that comes with it regarding sleep, eating, and exercise. Also, pet owners maintain more mental acuity or sharpness, due to the combination of being the care-giver to another entity, as well as owners often researching and reading about their specific type of pet and the best means of providing for it. Pets also live in the moment, they are not worried about the future, and this outlook can rub off on their owners. Pets are also useful for inducing memories of youth, friends and family, even specific places and events. Another benefit is that they add a purpose or meaning to life, a sense of being wanted and needed. They also provide a sense of well doing, as most pets are rescued from the shelter, and without someone to adopt them, their lives would end with euthanasia. Finally, pets offer a sense of security and friendship, something every human being seeks. As is the case with most circumstances in life, not everything about pets is perfect. There are some negatives that come with owning a pet, and this article would be remiss without acknowledging them. Roughly 86,000 injuries a year are reported in the United States due to pets, usually tripping over them. If your pets are anything like mine, when it is dinnertime, they are running circles around you. Also, going up and down steps with an energetic pet can lead to a fall. Also, drivers over the age of 70 are twice as likely to be involved in an accident if a pet is in the car. Pets also can contract diseases, so seniors with comprised immune systems may wish to look more into their personal conditions and the risks of having a pet. Now that we have covered some of the basic pros and cons of owning a pet, it is time to think about some pertinent questions before making the decision to own a pet. These are difficult questions, but a responsible pet owner should be aware of them. Are you willing to accommodate? Pets will force you to change certain behaviors and your routine. Do you travel a lot? Remember that you will need to find someone to watch your pet. Are you healthy enough to have a pet? Day after day of taking care of your pet can be challenging if you are in a state of poor health. What type of pet is right for you? Both cats and dogs have their pros and cons, so you should do you research to see which is right for you. There are other great pets, as well, such as fish, rabbits, birds, etc. What type of breed is right for you? Not all pets are created equal, meaning that different breeds can make owning a pet more or less challenging. Check out our list of the best dog breeds for seniors! What is the health and age of the pet you are interested in owning? Young pets require attention and training, old pets require care and accommodation. Cats and dogs, depending on the breed, can live up to 15 or 20 years. Is this a commitment you can make? What would happen if you could no longer care for your pet? Do you have friends or family that would accept the pet if needed? Can you afford a pet? Finances are always an aspect of life, and pets require money just like anything else. Research your ideal pet so you have an idea of what you are getting into to insure they will not become a financial burden on you. Each individual will need to decide for her or himself whether a pet is right for their life. I hope this has been useful and informative in the process of deciding whether a pet is right for you or a loved one.